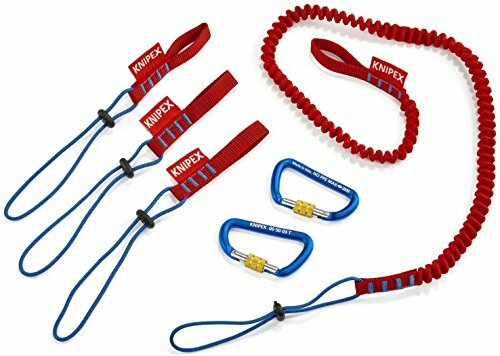 Knipex now has a tool tethering system available with three components - lanyard (00 50 01 T bka), adapters (00 50 02 T bka) and carabiners (00 50 03 T bka)! the components can be purchased individually or as a complete set (00 50 04 T BKA). the lanyard is made of gathered fabric tape that expands to approx. 5' when under strain, while the short adapter strap can be attached directly by the cord to the wrist, belt and climbing equipment. The carabiner features a screw Lock which prevents Gate from opening unintentionally.